Verify that all zone indicators are off, when all zones are closed (all doors, exits and windows are closed and motion in the protected area is restricted or bypassed), the system is ready to be armed. If one or more zone indicators are illuminated, it displays the open zones. Close open zones, or bypass them. Bypass any zone you cannot close, indicator flashes indicating bypassed zone(s). Note: Bypassed zones are not protected. Before leaving premises the system has to be armed. Arming the alarm system will turn on all detectors in the partition /s being armed. Enter user code and then [ENTER] to arm the system. There is a exit delay prior to the system being armed. During this delay time, a slow beeping is heard to indicate that the system is not armed yet and reminds you to leave the protected area. The A ,B or C indicator lights up to indicate that the system is armed. (The indicators may go out few seconds after exit delay expired, depending on the installer’s setting). If you must disarm the system during the exit delay, press [ARM]. Press [ARM] to arm the system. The A, B or C indicator lights up to indicate that the system is armed. During exit delay time, a slow beeping is heard reminds you to leave the protected area. Enter User’s code and press [ENTER]. The A, B or C indicator goes off to indicate that the system is disarmed. Enter User’s code and press [ENTER] to stop alarm any time, and turn off any audible sirens. This type of arming is used when people are present within the protected area. At nighttime, when the family is about to retire, perimeter zones are protected, but not the interior zones. Consequently, interior movements will be ignored by the system. To arm Stay mode press , enter user code, and then . The A, B or C indicator flashes to indicate that the system is armed in stay mode. When enabled by the installer, press [STAY] to arm the system. During exit delay you can leave the premises. If you wish to stay or that no one will enter the protected premises, you may cancel the Entry/exit delay by pressing the [ENTER] key. The slow beeping stops and the system is immediately armed. (The indicators may go out a few seconds after exit delay expired, depending on the installer’s setting). Enter user’s code and press [ENTER], or press [STAY] if enabled by installer. The A, B or C indicator goes off to indicate that the system is disarmed. The protected area can be grouped into 3 separate partitions (A, B, C). The system can be grouped for User ‘s convenience to separate, in a business environment, the offices from the warehouse area, or in a private residence, the different areas in the home, e.g., separate downstairs living area, detached garage, etc. During exit delay you can leave premises. At the end of the procedure the A,B or C indicator lights up to indicate that the partition A or/and B or C is armed . (The indicators may go out after a few seconds, depending on the installer’s setting). To disarm partition, see “Disarming the System”. Bypass any zone that cannot be closed. You can bypass selected zones prior to arming. It is also used to temporarily exclude a faulty zone from service, which requires repair. To bypass a selected zone, press [BYPASS], Bypass indicator lights up to indicate that the system is in bypass mode. Enter the zone number (e.g. 01, 05, 12) one or more zones, the zone LED indicators lights up to indicate that the zone is bypassed, following press [ENTER], the Bypass LED flashes to indicate zone(s) bypassed. Add the zone number (e.g. 03) one or more zones, the zone LED indicators lights up to indicate that the zone is bypassed, following press [ENTER] , the Bypass LED flashes to indicate zone(s) bypassed . To un-bypass zones, press [BYPASS], enter zone number (e.g.07,13),the zone LED indicators goes off to indicate that the zone is un bypassed and [ENTER]. Note: Disarming automatically un-bypasses all zones. A Chime (Day zone) is a detector that can be part armed while you are at home but working in another part of the building. It can be programmed to operate a buzzer or light to let you know you have a visitor. To disable the Day (chime) zone , press [CONTROL] and [PROGRAM] , Control LED indicator lights up to indicate that Chime is disabled. To enable Chime mode press [CONTROL] and [PROGRAM] Control LED goes off to indicate that Chime is active. The keypad enables control of external devices, such as an air-conditioner or heater. To activate or halt a device, press [CONTROL], Control LED lights up steady, press the number of the device, up to 8 different devices can be controlled via the keypad, then press [ENTER] to activate or deactivate the selected device. To check what outputs are ON simply press the [CONTROL>] key, LED’s corresponding to device ON lights up. Press [ENTER] to return to normal mode. Enter [BYPASS] + [ZONE#] (e.g. 01, 05, 12) + ENTER. (Bypass LED flashes to indicate zones(s) Bypassed). Repeat above steps to bypass more than one zone(s). Press [CONTROL] + [PROGRAM], Control LED turns off. Press [CONTROL] + [PROGRAM], Control LED turns on. Enter [MEMORY] to display events. (Use Memory key to scroll up manually). Press the [ENTER] to cancel Memory readout. This three special key’s function is best programmed by your installer to suit your individual situation. Most commonly it is used in a panic situation. These are a “PANIC” , “FIRE”, and “MEDICAL” alarm. When using the LED keypad the Panic alarm can be generated by either the single “Panic” button or by the simultaneous operation of two buttons. Pressing two buttons simultaneously generates the Fire and Medical alarms. Press the [PANIC] or Press simultaneously  and . The keypad emits signals (beeps) in response to User activities. These signals are listed in Table. Slow beeping Through the Exit or Entry delay time Exit or entry delay warning when arming the system indicates that you must exit the protected area, also Entry delay warning when entering via the entry zone, to disarm the system. There are 14 LEDs indicators show the status of the system. Full Arm ►[ARM] Initiates full arm Only if enabled by installer. Disarm during exit ►[ARM] Disarms the system during exit delay Only when slow beeping is emitted. Disarm ►[CODE]►[ENTER] Disarms the system Stopping Alarms. Arm Stay ►[STAY]►[CODE]►[ENTER] Initiates partial alarm when the user is home Only if enabled by installer. Bypass ►[BYPASS]►[ZONE #]►[ENTER] Bypasses a zone(s) Repeats the procedure to un-bypass zones. Initiate Panic ►+ Activates emergency alert Only if enabled by installer. Initiate Medical ►+ Activates emergency alert Only if enabled by installer. Initiate Fire Alarm ►+ Activates emergency alert Only if enabled by installer. Memory ►[MEMORY] Initiates display of events from memory. [ENTER] cancels memory readout Display events, and automatically scrolls to the next event every 2.5 sec. (Use [MEMORY] key to scroll up manually). Chime Enable/Disable ►[CONTROL]►[PROGRAM] Enable or disable chime function Only if enabled by installer. Control ►[CONTROL]►[DEVICE #]►[ENTER] Activates or deactivates outputs and devices Press [CONTROL] for 2 seconds. The keypad enables control of external devices, such as an air-conditioner or heater. To activate or halt a device, press [CONTROL], Control LED lights up steady , press thenumber of the device , up to 8 different devices can be controlled via the keypad ,thenpress [ENTER] to activate or deactivate the selected device. To check what outputs are ON simply press the [CONTROL>] key , LED’s corresponding to device ON lights up .Press [ENTER] to return to normal mode. Your panel will accept up to 6 phone numbers with a total of 16 digits. Your panel can be can be programmed to dial all or any of these depending on the event which has occurred. (The six phone numbers are at program address 331 through to 336). (The address for telephone number 1), The existing number will be flashed out at the keypad. then enter [NEW TELEPHONE #][ENTER] The new numbers will be flashed back to confirm acceptance. At any time you can enter in the address for the telephone number just to view the currently programmed value then press the [PROGRAM] button to move on to another address. Note: Address 331 = PH # 1, 332 = PH# 2 to 336 = PH# 6. The Control LED will lights up while the lock is active and turn off as soon as power is removed from the lock. The Access Control function can either be a single button operation or restricted to requiring a valid User code entry. Both options are shown above. Please consult your installer as to what option may be programmed. From time to time your installer may need to access the alarm from a remote PC to make changes to your programming and for security reasons they may have configured the alarm so that an authorized person on-site is required to make the alarm system answer the in-coming call. This option is only available in CLIENT mode. Provided the line connected to the alarm was ringing at the time the panel will now answer the call and allow a remote PC connection. Another powerful feature available from your alarm is Telephone Control. This feature is a remote control facility which allows valid users to access the panel via a standard touch tone telephone and check or change the Arm/Disarm status of each of the areas, operate each of the eight outputs or turn on an optional Microphone. 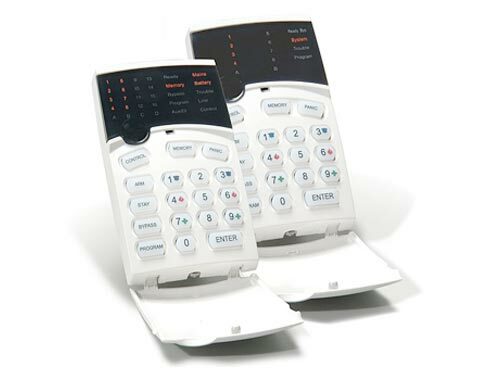 The Telephone Control feature is only available on panels fitted with a Voice or DTMF board. The Voice board provides voice prompts to guide you through Telephone control operations whereas the DTMF board provides tones (one Long Tone for ON or three short beeps for OFF). Please talk to your installer to find out if all or any of these options are available on your alarm. To perform any of the Telephone Control features you must first ring the phone number, which the panel is connected to. The panel may be set up to answer after a specific number of rings of it may be set-up to use a fax defeat option (ring once, hang up and call back within 30sec). Either way, when you ring the phone number and the panel answers the call, the first thing you will hear over the phone is a burst of modem tone for two seconds. After this tone has stopped you must enter the access code, which is associated with the Telephone menu option you wish to access. Remember, the code you enter will determine which menu option you access. If you miss the pause, the panel will repeat the modem tone and then again pause for 5 seconds looking for your access code. This process will be repeated 4 times before hanging up if no valid code is received. When entering codes or other information in Telephone Control the “#” key acts as a “Clear” button. When you have entered the required 4-digit access code the panel will reply with the status message associated with the Telephone Control function you have accessed. For example, lets say we have a code of “2045” to allow Arming & Disarming of Area A. Once the code “2045” has been received the panel checks the current status of Area A and replies with the pre-programmed voice message relating to that status e.g. if Area A is Armed then the Armed message will be sent, if Disarmed then the Disarmed message will be sent. If only the DTMF board is fitted, the voice message is substituted with a long beep if Area A is Armed, and three short beeps if it is disarmed. Once the status message has informed you of the actual state, you can use the “*” key to toggle the option on & off or Arm and Disarm, e.g. in our example above, code “2045” accesses Area “A” arming or disarming. While you are on-line with the panel you can move between menu options by entering the code of the option you want to control. Assuming there was a code of “4321” programmed to control outputs. After having used code “2045” to control the Arm/Disarm status of Area A we first press the “#” button to reset all previous entries. Then we can enter the digits “43215” (that is “4321” as the code to control outputs and “5” to select output #5). The current status of output #5 will be given either by the voice message or the appropriate tone and then the status can be changed with the “*” button on the remote telephone (Note; For output control you must enter in the 4 digit code e.g. 4321 followed by the output number you wish to control, in this case 5). At any stage, if you enter in an incorrect code you can press the “#” button on the remote telephone to clear all code entries and then start again. To turn on the optional Microphone (only available if the Voice Board is fitted) you must enter in the appropriate code followed by the “*” button. To turn the Microphone off you simply press the “*” button again. To end a Telephone Control session simply hangs up the phone. The panel is monitoring the line at all times and 15 seconds after the last key press it will automatically hang up the line. This 15-second timer is active during the whole Telephone control process so a period of 15 seconds without a key press will cause the panel to hang-up. If a Telephone control code for outputs is programmed and the output/s are allowed to be locally controlled from the keypad, then entering the 4 digit code at a keypad will blank the display and the zone LED’s will now indicate the output status e.g. if output 1 is on zone 1 LED will be on. By now pressing the “1” button at the panel keypad, output 1 can be turned off provided it is allowed to be locally controlled. To leave local Telephone control mode simply press the [ENTER] button and the keypad will return to normal operation. This feature works the same way that “Directly Controlling an Output” works (see page 14) only it requires a code to access the function. The alarm system has an internal clock that may be used to automatically Arm or Disarm the alarm or turn Outputs On or off. It is also used to identify when events occurred in memory via the LCD keypad. Should you need to change the Time & Date it must be done from CLIENT mode. While in CLIENT mode a User with the proper authority can start walk-test mode. This special mode latches the alarm signals from detectors at the keypad initiating the test so that one person can trigger every detector connected to the alarm then return to the keypad to verify operation. On terminating Walk-test mode the test results are put into the memory buffer so they can be viewed at a later time. To start Walk-test mode while in CLIENT mode press [PROGRAM][ENTER]. The keypad buzzer will beep at 1-second intervals. Next trigger every detector connected to the panel then return to the keypad and all of the zones that were triggered will be displayed at the keypad. To terminate Walk-test mode press [ENTER]. The keypad will stop beeping and automatically exit CLIENT mode. When viewing the memory events at the keypad by pressing the [MEMORY],the first thing that will always be displayed is the system messages. If the system led turns ON but no other Zone LED’s are ON at the same time, this means that there are no current system alarms. If a zone LED and LED’s are ON then this indicates system alarms that have not yet cleared. The LED’s 1-8 are pre-defined as to what system alarm they will display. These system alarm indications are shown in the table below. Following the display of current system alarms the panel will then sequence through the 127(Powerwave 8) or 255(Powerwave 16) historical memory events starting at the most recent event. The second table shows the alarm events that can be displayed in memory mode and what indicators are used to show them. Any failure or abnormal events that may occur are indicated by trouble messages, and the Trouble indicator is lit. Press [MEMORY] to read out messages and other events stored in memory. The system memory stores the last events. Press [MEMORY] to display list of events. Following the display of current system alarms the panel will then sequence through the 255 historical memory events starting at the most recent event. The second table shows the alarm events that can be displayed in memory mode and what indicators are used to show them. The system will display the last event and automatically scroll to the next one every 2.5 seconds, and a beep is emitted. Use the arrow keys to scroll up manually. Wait until all messages are displayed, or press [ENTER] to cancel memory readout. There are 2 levels of program mode, CLIENT mode and INSTALLER mode. Normally the installer will give you access to the CLIENT mode so you can add, delete, or change the user codes. If you request it your installer can provide you with access to the INSTALLER mode as well. To get into CLIENT mode provided the system is NOT armed Press [PROGRAM] enter Master code and [ENTER]. The Program indicator lights up to indicate that the system is in User programming mode. If you get a single long beep at this point and the Program LED doesn’t turn on, it means your code cannot access Program mode. To exit out of program mode press and. The Program indicator goes off to indicate that the system is not in User programming mode. About Master code and User code. The factory default master code (123) is intended as a preliminary control of the alarm system. After PowerWave is installed and put into service, the code can be changed to any code known to the Master user. The Master user can define up to 49 user codes. To limit access rights, the holder of the Master code can ask the installer to define several User profiles. User can allow access to installer program mode from client mode. While in CLIENT mode, Press [PROGRAM] and 1 to change Master code press [ENTER], the code digit will be flashed back to you. Use the numeric keyboard to enter your new Master code. The code can hold any combination of 1 to 6 digits. It is recommended using a multi-digit code. . Press [ENTER] to save your new code, the new code will be flashed to you and 3 short beeps to indicate correct entry or 1 long beep if not accepted. Press [PROG] and [ENTER] exit user Code Program mode. While in CLIENT mode, press [PROGRAM] and the User number (2 to 50) to add or change the code, press [ENTER]. If there is an existing code already, it will be flashed back to you. Use the numeric keyboard to enter the new code. The code can hold any combination of 1 to 6 digits. Entering the new code will delete the old code. Press[ENTER] to save your new code, the new code will be flashed to you and 3 short beeps. Repeat the procedure for all users. Press [PROG] and [ENTER] to exit Local Program mode. In client mode, press [PROGRAM] and the User number (2 to 50) you intend to delete, press [ENTER]. The code will be flashed back to you. Press [BYPASS] to delete User code. Press [ENTER] to save the change. Press [PROG] and [ENTER] exit program mode.